If you want a top-of-the-line robot vacuum with all the bells and whistles you can imagine, you should be prepared to pay around $700 to get one. 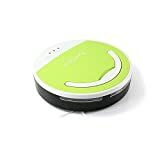 But if all you want is a simple robotic vacuum that will pick up dust and light dirt in between house cleanings, the Pure Clean Smart Robotic Vacuum Cleaner is a fantastic option. It does a good job on hard flooring and runs for about 90 minutes per charge, and it only costs $55 right now on Amazon. FULL CONTROL OF YOUR LEVEL OF CLEAN: The 3 selectable modes allow you to choose your level of cleaning. Select with the top Panel Touch Button Control Mode Selector from 10 Min., 20 Min. & Max Mode (90 minutes) depending on the room size and how dirty the floor is. Just set the time and let your Smart Robot Vacuum Cleaner do all the work with a Simple One-Button Activation. Works on Hardwood, Linoleum, Tile, Low/Hard Carpet Floors and has a Secondary Spinning Side Brush that Lifts Debris. EASY USAGE AND STORAGE: This vacuum has detachable brush for easy cleaning. It has Automatic ‘Bag-less’ operation with garbage collection tray that opens for easy disposal. When the Pure Clean Smart Robot Vacuum is done cleaning storage is easy. Its low profile and compact size allows it to be stored anywhere easily and rapidly. This makes the Pure Clean Vacuum an essential tool for home cleaning. RECHARGEABLE BATTERY: Charge the unit via the included power cable. The built-in battery allows the unit to be used without having to be connected to a power source. This gives the vacuum a full range of motion so it can get into every area of your room to leave it clean and the unit has operation LED light indicators to let you know where you stand – Includes Charging Cable Power Adapter.